For some absolutely crazy and illogical reason, one day in August, I began looking at rescue dogs, err rescue LABS for adoption. And with that said, we all know how this story is going to end right? Haha. It had officially been a year since losing our super heroine, the yellow dog (and another rescue) named Roxy. As many other dog owners probably share in my sentiment, I went through all the phases of loss, followed by the declaration that no dog could ever replace Roxy (which is true). But I kinda swore to myself (internally) that I wouldn’t get another yellow Lab. It’s not a feeling that can be accurately articulated with words other than saying, it just wouldn’t feel right. Then a few months ago, I was working on my flower beds in the backyard, and my shovel made an all too familiar but distant sound…Squeak! It was me, my shovel and earth and I really thought I was losing it until I unearthed one of Roxy’s long lost tennis balls. Despite no longer having its iconic green fuzz (and slobber), it still had its squeaker in-tact. And in that moment, she spoke to me. Enter stage right…Charlie, formerly known as Nancy, but not as a result of doggie gender surgery. Our girl had already been through numerous surgeries by the time we made her acquaintance. You see, Charlie was found in Louisiana, victim of a gun shot wound to her right leg. Whether intentional or accidental, a fact that only Charlie will ever know, a team of very dedicated veterinarians and volunteer foster parents managed to heal this girl with medicine and all of their love. She fought off an infection and not only won that battle, eliminating the need for amputation of her leg, but she also won the war with her many, many, many dog cones & collars. At one point she appeared as though she could transmit signals to another universe. And maybe it was her signals that reached me. When I found her photo and story online, I felt an almost surreal connection to this pup and bringing her home became my obsession. My dad asked me “why Charlie?” Much like with the name of my son, I don’t really have a romantic story of how it came to be. The answer was “it just felt right.” There are some things in life that simply can’t be explained. And in my case, so many of my ideas seem to come to me amid my sleep or sitting on the beach. 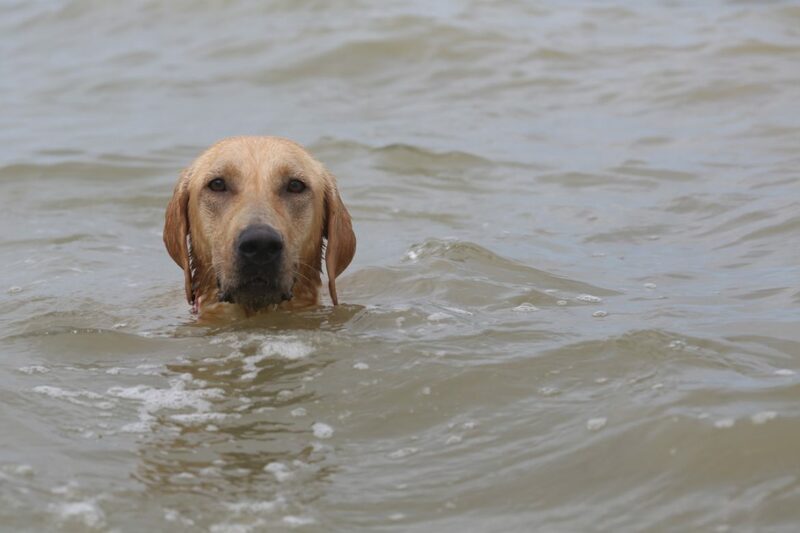 “Charlie” originally came to me as I tried searching for names that sounded great prefaced with “Chesapeake.” See Charlie’s new lease on life came via Virginia, home to our fabulous new friends at Lu’s Lab Rescue and one of nature’s most fabulous gifts to us, the Chesapeake Bay. It was here that Charlie officially became part of our family while camping. It was here also that we learned of her labsession with water and in this water that she very quickly became her namesake, Charlie the Tuna. But it was after spending the past month with her that I believe I’ve found the true origin of her namesake, Charlie Brown. As an illustrator myself, I have had a lifelong love for Charles Schultz and the Peanuts gang. Snoopy was one of the first characters that I ever drew. There is simply something that feels like family when I think about the Peanuts characters. Then in some recent design research I was conducting, I came across a very poignant article about the history of Charles Schultz and Charlie Brown. When I look at Charlie the dog, I see all of these things. Much like my favorite hero of defeat, but never beat, Charlie Brown, this fur ball has witnessed first hand what no human or animal, should ever experience, yet she comes back over and over and over again with her ball. It’s a lesson for many, including myself, to “never, ever, ever give up,” even when you feel like the sun will never return from behind the clouds. Keep throwing the ball, chase it down, pick it up and throw it again.